Experience the magic of the Dubai desert on a sunset safari drive. 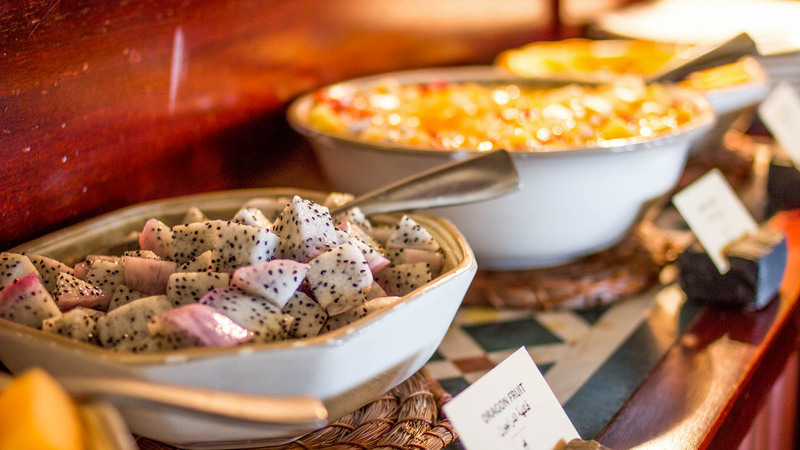 Enjoy a buffet dinner at a Bedouin-style camp and traditional entertainment. Visit the Dubai Desert Conservation Reserve to swap the hot bustle of the city for a scenic journey through the UAE's charming landscapes and traditional cultures. Here are a few fun ways to make the most of a unique day trip! 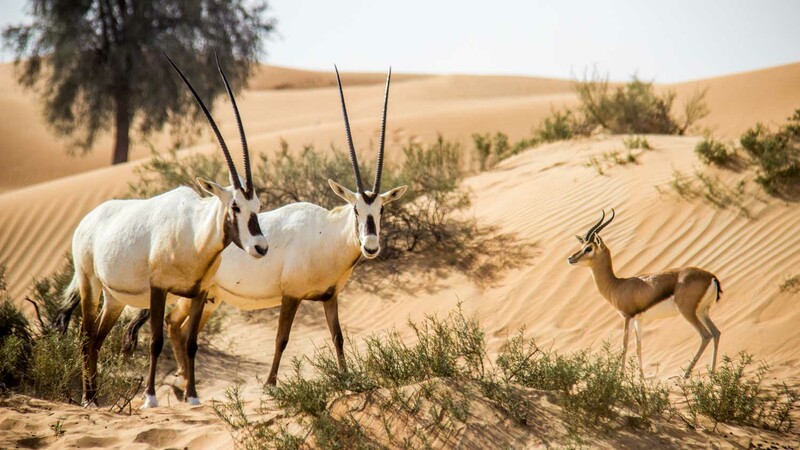 Desert safari tours will introduce you to a whole host of native flora and fauna, including foxes, wildcats, and the reserve's greatest conservation success, the Arabian Oryx! 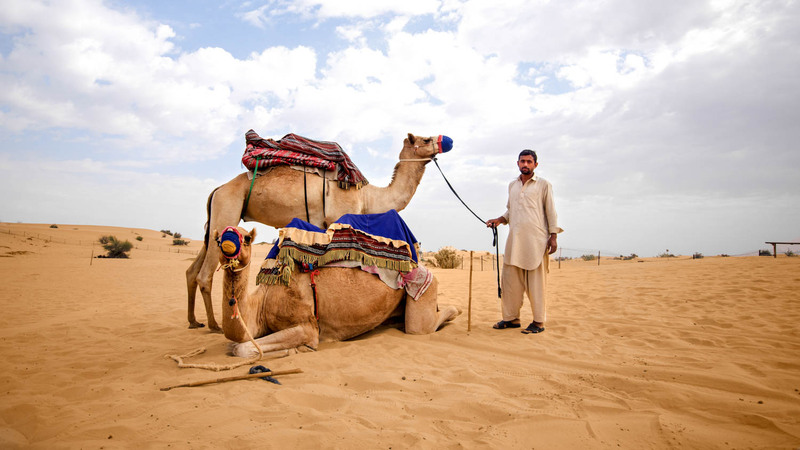 If cruising the desert landscape in an off-road vehicle lacks romance, why not let an experienced guide lead you through the sites of interest by horse or camel? The Bedouin's name means "desert dwellers" in Arabic and you're on their turf! Fortunately they provide great food and entertainment from the comfort of their homey tents. Fancy a break from tradition? 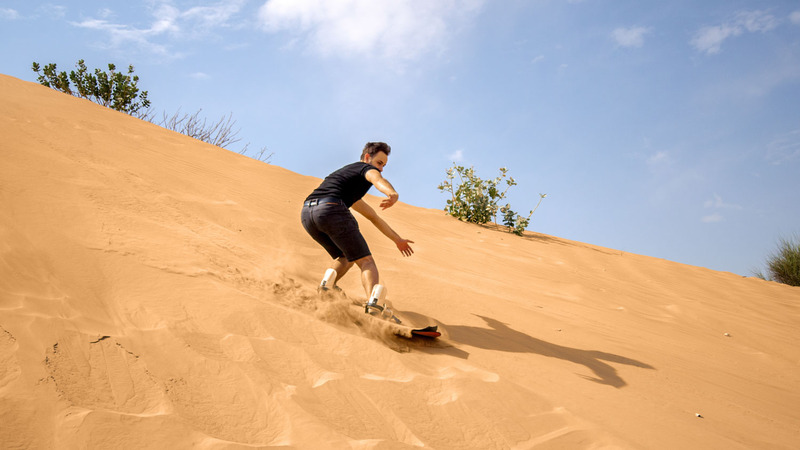 The sand dunes make an ideal setting for extreme sports like quad biking, sandboarding, and even sandskiing! Whether you choose to see the sun set from the top of a dune or amidst the hospitality of a lamp-lit Bedouin village, don't miss this exquisite national park at its most stunning. It isn't possible to visit the reserve without an approved tour group, so look out for tour operators that provide transfers from your hotel or the city center. Otherwise you can only reach the reserve by car via the E66, which starts out as the Dubai-Al Ain Road between Downtown Dubai and the Ras al Khor Wildlife Sanctuary. The desert is, of course, very exposed to sunlight, so bring sunglasses, suitable headwear, and plenty of sunscreen! You'll need to use a lot of the latter so bring moisturizer to stop your skin drying out. If you're bringing an expensive camera then make sure it's protected against the sand (waterproofing also works! ), and bring a water bottle even if your tour operator is providing it, just in case. Also, do NOT wear closed leather shoes! 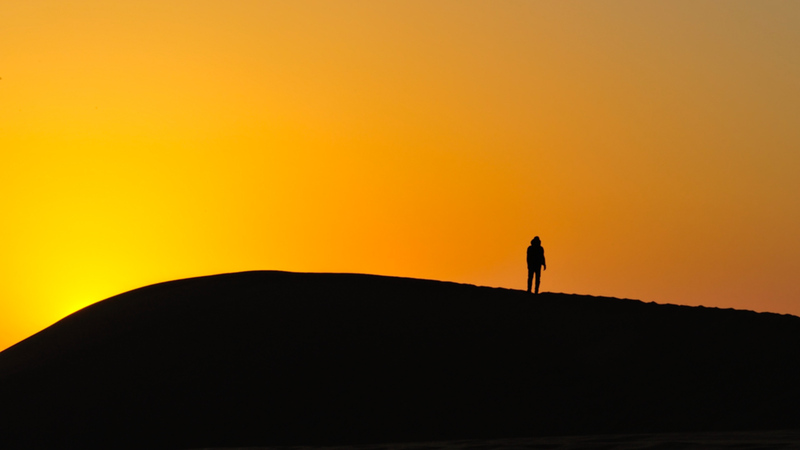 The desert is there day and night, so it all depends on when you schedule your tour! Depends on the experience you are seeking, but prices usually start around $100 per person. Your chosen tour guide will take you there in a private van from the city. Eat lightly before your excursion. The bumpy ride across the dunes can make some people feel queasy! Wonderful experience. Lovely and wise driver. This was a Fantastic once in a life time experience. But I want to thank specially to our driver-guide from Arabian Adventures; Abdurrazzak. He is great Pakistani guy, helped us, entertain us. We have learned a lot of things about desert from him. Thanks. Picked up at the hotel with a jeep through Rebecca our Falconer. With her in the Jeep, one of the birds (it was an eagle, name = forgotten) :-) After an hour drive, with a short stop at a camel race course, we arrived at the Dubai Desert Resort in time with the sunrise. In the desert resort we had a short drive, to watch animals like oryx, mountain gazette, etc. After arriving at the spot for the bird show, Rebecca was explaining us the methods and internals about here work as Falconer. The demonstration for our group includes a hawk, an eagle, an owl, and a falcon. We stood the whole time in our group of four and finishing with the stop at the Dubai Falcon Souk. Thanks to Rebecca we appreciate this tour with unforgettable memories. The tour was exceptionally well organized as well as informative. The tour was exceptionally well organized and the tour guide started early in the morning on the route to the desert to provide us with a lot of insights into falconry as well as other cultural aspects such as the camel races. In the desert we were able to get hands on experience in the training of falcons and again learned tremendously from the guide's experience and knowledge. After the training we had an excellent breakfast in the desert to enjoy the beauty of the landscape along with some excellent food. This was a brilliant experience with a very knowledgeable guide Nadir. The whole evening was brilliant. Thank you from a very satisfied customer.